This June, Dr. Tuesda Roberts will join the college as Director of Faculty Development and Diversity. This new full-time staff position was created in response to the student petition to enrich inclusive pedagogy in the classroom, design and lead specialized programs concerning inclusive pedagogies and instructional strategies, and infuse diversity and inclusion in all faculty development programs at the College. Tuesda earned her Ph.D. in Curriculum, Instruction and Teacher Education, with a specialization in Chicano/Latino Studies and a certificate in Urban Education, at Michigan State University and an M.A in Foreign Language Education and Teaching English to Speakers of Other Languages at New York University. She was a Post-Doctoral Fellow at the University of Pittsburgh Center for Urban Education. 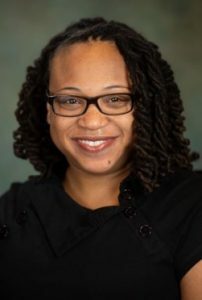 In her current position as Assistant Professor of Multicultural Education at Missouri State University, she is involved in training and mentoring instructors, developing curriculum and resources, and strategic planning to ensure more holistic and culturally relevant teaching practices and curriculum. Before joining the faculty at Missouri State, Tuesda taught Spanish language and literature at Johnson C. Smith University. We would very much like to thank the students, faculty, and staff who served on the search committee (which began in spring semester 2018 and continued through fall semester 2018): Lex Fernander, Sydney Logan, Raz Moayed, Miranda Banks, Kaysha Corinealdi, Cara Moyer Duncan, Wes Jackson, Heather May, Paul Milhailidis, Yasir Munif, Wendy Walters, Robert Amelio, Samantha Ivery, and Carol Parker.